Music can have a strong impact on our mood. Sad melodies can make us sad on our best days, and uplifting ones can make us forget about all our troubles in a span of minutes. The benefits of music do not end there, though. In fact, creating a musical intervention for individuals with Parkinson’s disease can help them in many ways. We are not the only ones saying this though, science and research says it as well. According to the American Parkinson Disease Association, certain types of music stimulate the production of dopamine and serotonin — the very neurotransmitters that are reduced in Parkinson’s disease patients. With new research every day, experts are finding more and more reasons to introduce music therapy into the lives of Parkinson’s patients. One of the first symptoms of Parkinson’s disease includes problems in motor function. It begins with tremors in limbs, and then regresses to slow movements, which can often end up with no movement at all. The degenerative disease slowly derails the brain’s ability to control body movement. However, music-based movement therapy can aid the patient in reinstituting their normal movements. The music therapy intervention could include singing, dancing, and even playing musical instruments. It helps the Parkinson’s patients rework their emotions, movements and other neurological factors that have been affected by Parkinson’s disease. Music does this by influencing the part of brain that is in control of these behaviors. In addition to decreased movement, the body of a person suffering from Parkinson’s disease becomes unusually stiff. The patients begin to show lack of expressions on their faces, their arms do not move when they are walking, and their muscles become rigid. A music therapy application called vibroacoustic therapy can helppatients deal with this symptom. What this therapy does is, it sends music vibrations that are felt and heard by the patients. As a result, the stiffness in their bodies is reduced as they feel the vibrations of the bass tones. Whether someone is good at singing or not, doing it can help them improve their posture and their breathing if they follows all the right techniques. A regular person can benefit from singing in different ways. For a Parkinson’s patient, singing can make a difference in their ability to speak or control vocal outbursts. Since Parkinson’s is a degenerative disease, singing can slow down the regression in their vocal strength. 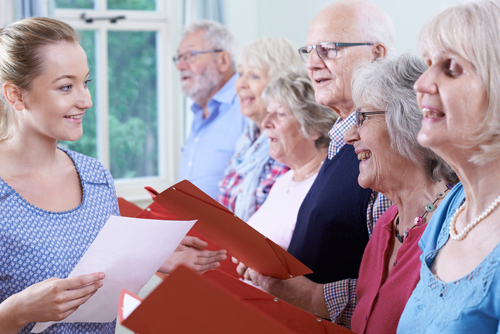 According to Medical News Today, Parkinson’s’ patients who attended group singing sessions experienced a significant improvement in their vocal loudness, pitch duration and swallow control. In addition to benefiting the patients physically, music therapy also helps patients of Parkinson’s disease to maintain their emotional health. Being diagnosed with Parkinson’s disease is not an easy pill to swallow when the symptoms begin to show up. Music, in those times, fill patients with hope, uplifts them, and provides them with the strength to fight it.